The Village of Ossining seems to be on the move, thanks to Mayor Bill Hanauer. He’s an artsy guy. I first met him at the MTA of all places where he and I were panelists on a committee selecting artwork for the Ossining train station. He was shaking hands and loving it this particular Sunday at the Ossining Library, where sixty local artists showed their work courtesy of the Ossining Arts Council (OAC), which has new vitality and a new president. The new president, Mark Sarazen, is another artsy guy who specializes in Giclee digital print-making. He moved here from Chicago and still does work for the venerable Joffrey Ballet Company. As a new and slightly naive resident, he stumbled into his first meeting of the Ossining Arts Council (www.ossiningartscouncil.org), not knowing that four months later, he would become its unofficial president, later to be officially anointed. And a good thing, too. Sarazen has rallied the troops, ably assisted by artist/filmmaker Mark Sadan and curator-in-chief John Wunderlich. OAC now boasts 125 members and lots of irons in the fire with neighboring groups in Peekskill, Croton and Briarcliff. Just this Sunday, Elsa Rubenstein of the Briarcliff Manor Committee for the Arts (BriCa) collaborated with OAC in a discussion of life and art in Cuba led by SUNY Purchase Provost Dr. Damian J. Fernandez, a native of Cuba and author of “Cuba, the Elusive Nation” and “Cuba and the Politics of Passion.” Laura Mogil, one of the BriCa founders, was at the library selling tickets for event, along with Josie LaRiccia of Josie’s International School of Dance (www.josiedance.com), whose Viva Danzas Espanolas will take place on April 23 at the library. It’s all proof that it takes a village, at least when it comes to arts in the community. 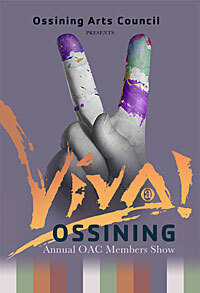 Speaking of the village…that is the Village of Ossining, Mayor Bill has a few more artsy things up his sleeve. These include an unveiling of the artwork at the train station (shhh, the artist is a not-so-well-kept secret) and a village-wide outdoor sculpture show in the plans for 2013. So stay tuned! And, if you want to know whose artwork will be in the Ossining train station, hit the orange blog button on (www.artswestchester.org) and give me a shout.